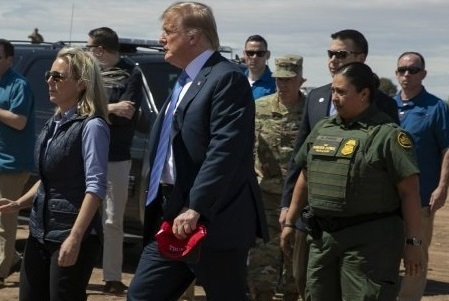 President Trump spoke those words at an appearance Friday in Calexico, California, on the border with Mexico. He repeated them on Fox News “Fox and Friends” on Saturday morning. “We need people,” he said on that occasion. Well, we don’t. He was right the second time. The country is full, and getting fuller. The system is not designed to accommodate the huge numbers of “family units” (adults traveling with minor children), given existing rules and court decisions related to migrant children. For that reason, ICE has had to release into the U.S. 125,000 illegal migrants since late last year. Homeland Security Secretary Kirstjen Nielsen, whose department bears the brunt of the current migrant challenge, has been pleading for assistance from other departments and agencies, such as the Department of Health and Human Services and the Defense Department, with little success. She also has asked the do-nothing Congress for help with revising the laws she’s charged with enforcing, to no avail. Our elected representatives, as usual, are either still conspiring to remove the President from office or else solely concerned with their own re-election efforts to be bothered. Meanwhile, Trump flails, making contradictory statements himself while trying to get others in the executive branch to speak with a single voice. Assisting in this effort, fortunately, is senior White House adviser Stephen Miller, who has become the immigration restrictionist voice of the administration. Word is that Miller is attempting to replace some officials he regards as soft on immigration with others more in tune with his own hard line. President Trump has also said that he wants to go in a “tougher direction.” There’s no time like the present. God bless this true American for upholding our laws.